Delaware County Engineer Chris Bauserman accepted his County Engineer of the Year award during the County Engineers Association of Ohio (CEAO) annual business meeting on Dec. 9-11. Pictured, left to right, are Dean Ringle, Executive Director of CEAO; Chris Bauserman, Delaware County engineer; and Paul Gruner, Montgomery County engineer. 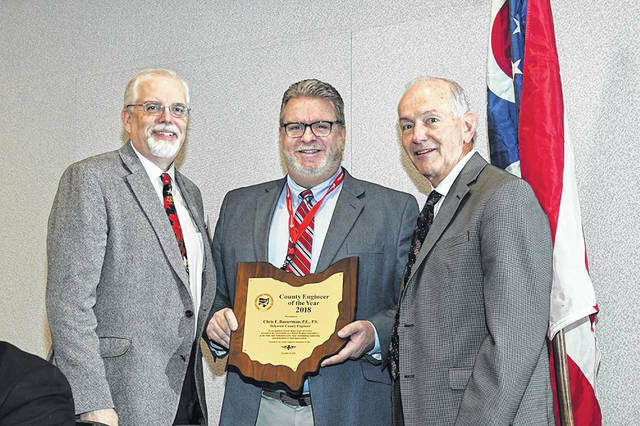 Delaware County Engineer Chris Bauserman, P.E., P.S., and staff received the 2018 County Engineer of the Year award from the County Engineers Association of Ohio (CEAO) during its annual business meeting held Dec. 9-11. “It’s a nice honor, but to be honored by your peers is a very gratifying recognition,” Bauserman said about receiving the award. Bauserman added his staff had a lot to do with him receiving the award. “I’m just one member of a larger team,” he said. According to the CEAO website, since its establishment in 1940, the organization has worked to unify members in providing the best quality transportation, drainage, surveying, and land record keeping for the safe efficient movement of people, goods and services, and continuing land development need. The number one job of the CEAO is the traveling safety of Ohioans and the visiting public. Bauserman said he has been with the county engineer’s office for 29 years. Initially, he served as chief deputy engineer before serving as county engineer, a role he has held for the past 22 years. He said when he first came to the county, the U.S. Census put the population of Delaware County around 60,000 (today almost 200,000); Old State Road was traveled by 2,000 vehicles per day (20,000 vehicles nowadays); and there was no Polaris interchange off of I-71. Bauserman said the thing he is proudest of is making Delaware County roads safer for motorists. Bauserman has earned numerous awards and accolades over the years. He was the 2017 president of CEAO, and he awarded the Urban Engineer of the Year award in 2016 by the National Association of County Engineers, for which he is a past president. Bauserman worked as a project engineer in the construction and private consulting engineering industry prior to coming to Delaware County, and he holds a Bachelor of Science in civil engineering from Ohio Northern University. The county engineer’s office maintains 340 miles of paved county roads with the greatest responsibility being to keep the roads clear in the winter by plowing and salting; the maintenance of ditches and waterways under and along county roads; and the maintenance of over 7,000 road signs, 1,000 culverts and 30 bridges. This entry was tagged Chris Bauserman, County Engineers’ Association of Ohio, D. Anthony Botkin, delaware county, Engineer. Bookmark the permalink.